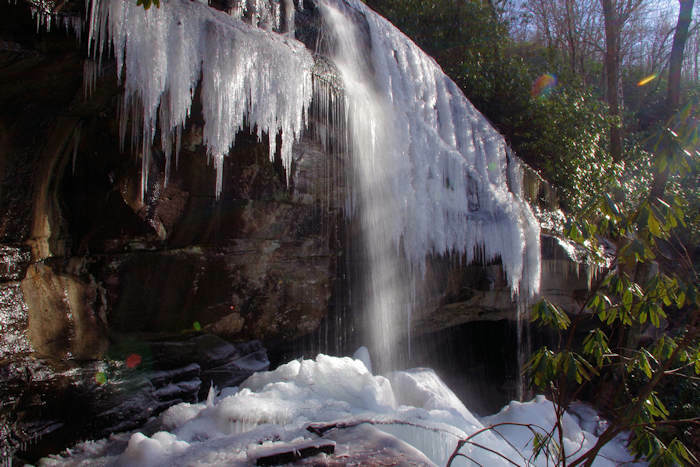 Near the popular Looking Glass Falls is the hidden jewel of Moore Cove Falls. It's one of the few waterfalls that you can walk behind. 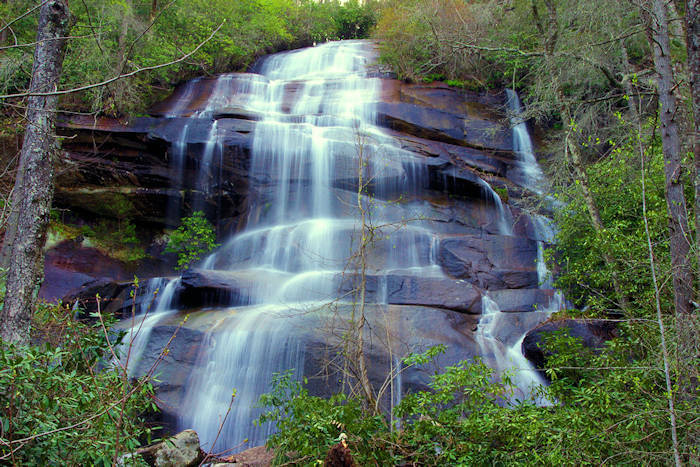 Hike to this 50-ft. tall waterfall from a small parking area by a stone bridge on U.S. 276 (Forest Heritage Scenic Byway), one mile north (toward the Blue Ridge Parkway) from Looking Glass Falls in Pisgah National Forest. There are no signs on the highway for Moore Cove, but there is an information board by the parking area so you will know you are in the right spot. 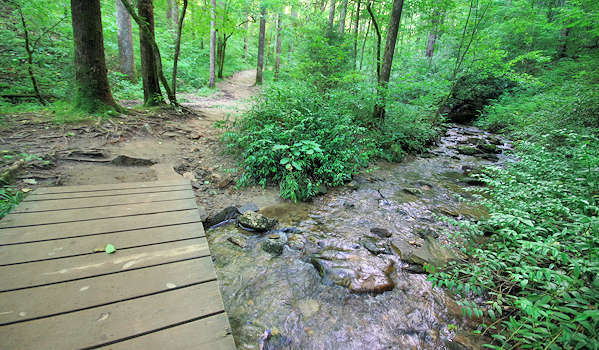 Begin your 3/4 of a mile hike (1.5 miles roundtrip) by crossing the wooden pedestrian bridge. It's a fairly easy hike with no steep sections - great for the family. It's a popular spot especially on weekends and summer days, so get there early to avoid the crowds and get a parking spot. Above is the view from behind the waterfall. Moore Creek has a low volume of water, especially during dry spells. The waterfall is most spectacular after a good rain. Extended dry weather can reduce the falls to a trickle. 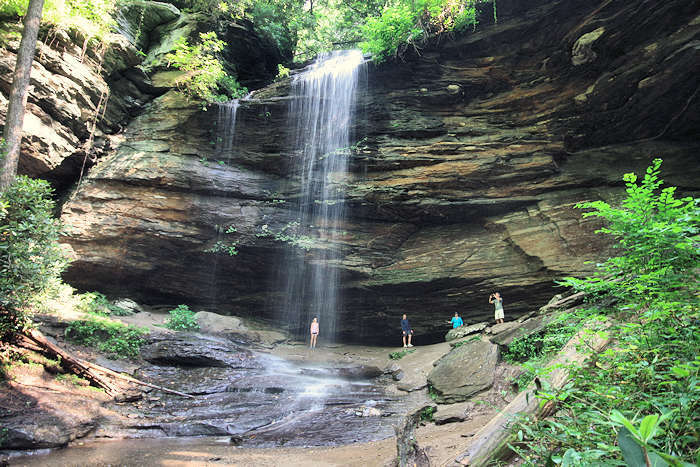 Our favorite part of this waterfall is the ability to walk behind it and hang out under a large rock overhang. What an enchanting setting! It's pet-friendly, but keep dogs on a leash. This is a great winter hike option. 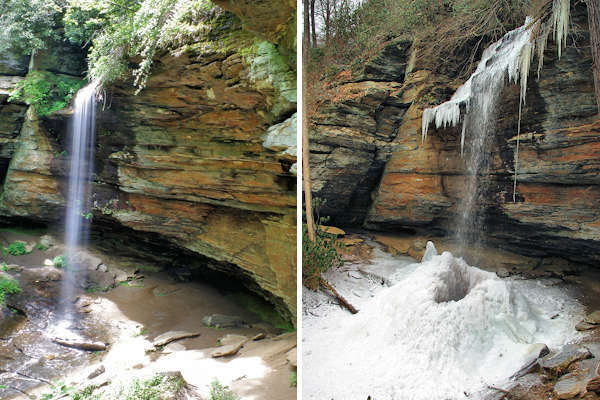 During cold periods, a big ice cone can form at the base of the waterfall. The hike is relatively easy with a few steep steps, mostly at the beginning of the trail. 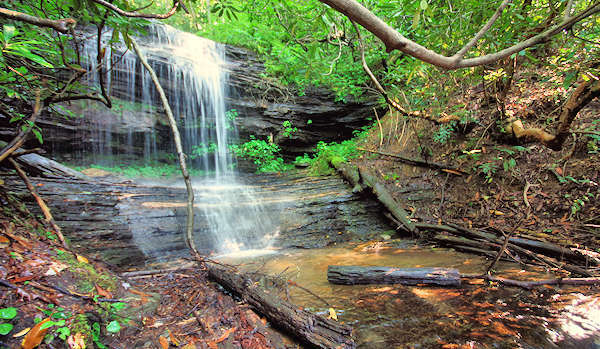 It's a beautiful walk, crossing Moore Creek several times before you reach the waterfall. The trail travels primarily through a lush, hardwood forest with areas of rosebay rhododendron and carpets of fern. After passing behind the falls, the trail continues steeply up the ridge (about 1/4 of a mile) to reach a similar much shorter waterfall. Only experienced hikers should tackle this section. Do not try to reach the top of the waterfall. You could slip easily - the fall would probably be fatal. Directions: There is no GPS address. From the intersection of Hwys 64, 280 and 276 north near Brevard, drive north on Hwy 276 north through the Pisgah Forest entrance. 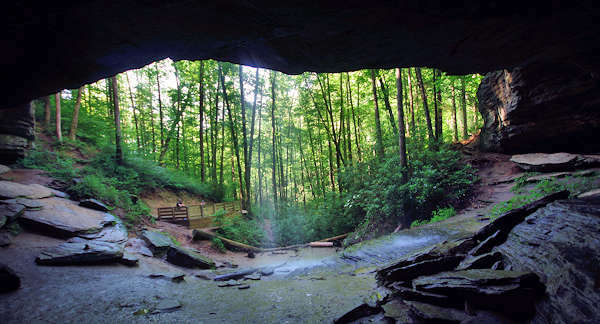 Drive about 6.5 miles (one mile past Looking Glass Falls) and look for a small parking area on the right - just before a stone bridge. If you are coming from the Blue Ridge Parkway, get off at the Hwy 276 exit and drive south for 8.2 miles, cross the bridge and pull off on the left. The trail begins on the bridge side of the info board. Cross the wooden foot bridge. 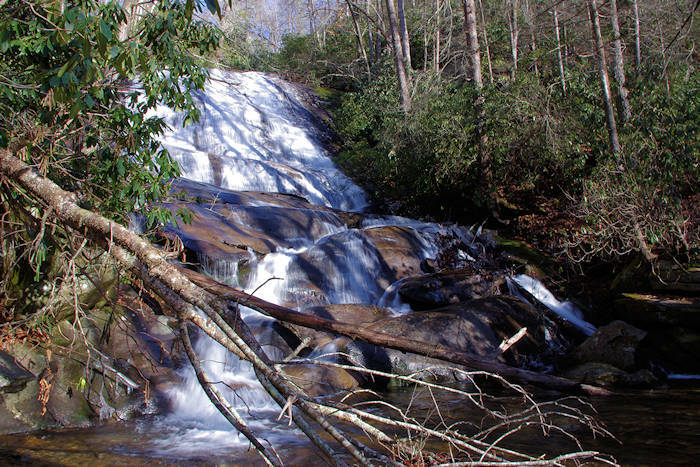 More nearby waterfalls: Twin Falls, Slick Rock Falls, Daniel Ridge Falls, Cove Creek Falls and Log Hollow Falls. 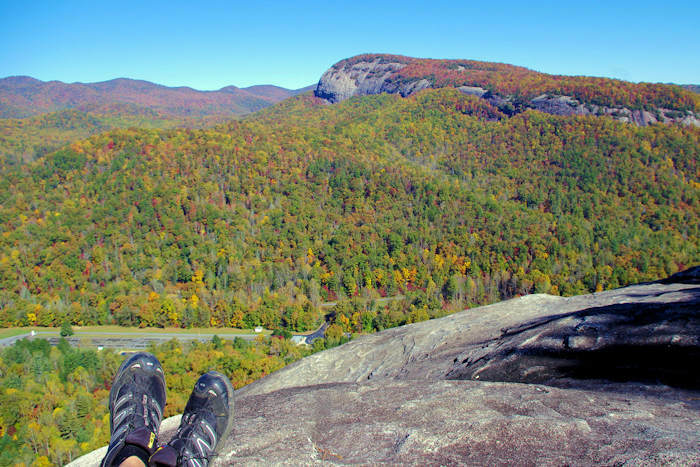 Also nearby are Sliding Rock and the Looking Glass Rock hiking trail.